Same here. I used to use Arc-Dark, but then I found Adapta-Nokto and fell in love. I use it in XFCE and Cinnamon, too. Great eye! Sure am. Adapta-Nokto-Eta. You’re right, Wayne. Manjaro currently ships with AUR support disabled and no install option to enable it. You have to go into pamac preferences and turn it on manually. They also do some weird stuff. For example: every distro I can think of, ships XFCE with desktop icons at 48. Manjaro ships them at 32… Why?! lol. At 32 the text wrap blows up for pretty much everything. Firefo… Add/Re… Comput… Looks terrible with everything getting truncated. 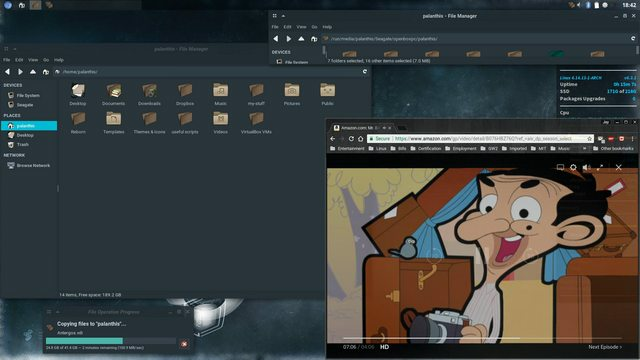 @ssspacez I like to think of the initial XFCE desktop like a blank canvas. No one would just leave it like that. It’s just waiting for you to tweak it to your heart’s content. Kind of like OpenBox. Glad you found Reborn! I am also over there, so pop over and say hello. We couldn’t have made Reborn without the incredible work that Antergos does!